Sometimes a simple soup is most appealing on a chilly night. You cannot get more basic than this easy cream of chicken or turkey soup. Whether you serve this soup as a first course to family or guests or as part of a casual pairing with sandwiches, it's a good option—and easy in the bargain. This recipe can be found in "The New Doubleday Cookbook" by Jean Anderson and Elaine Hanna. Bring the broth to a simmer and slowly mix in the cream. Add salt to taste, pepper, and nutmeg. Cover and let mellow over lowest heat for about 10 minutes. Serve hot or icy cold, topped with minced parsley. 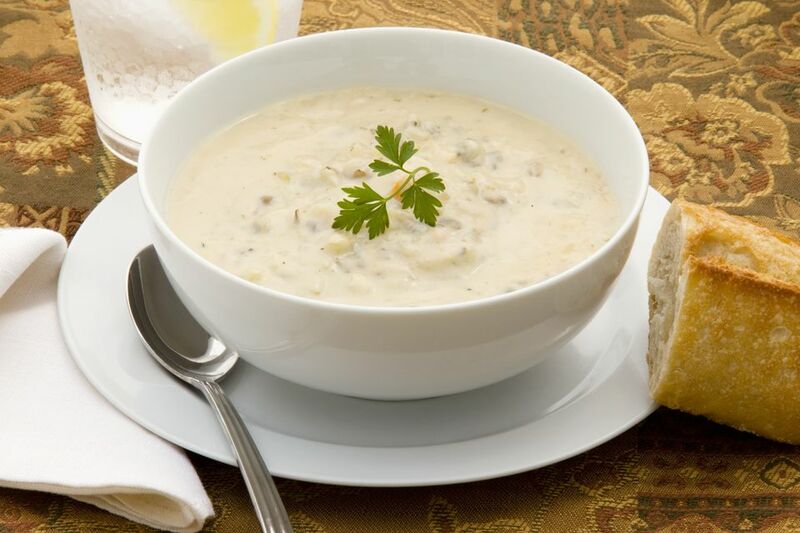 For homestyle, chunky cream of chicken or turkey soup, make a cream sauce, substituting a cup of half-and-half for the heavy cream, and add the broth. Cook until thickened, mix in the spices along with chopped, cooked chicken or turkey, potatoes, peas and/or carrots. Serve cream of chicken or turkey soup for lunch on the weekend or for a casual weeknight dinner with a spectacular sandwich that complements its simple and subtle flavors. A pesto chicken panini adds an Italian twist, while grilled cheese with turkey on sourdough turns it into a comfort meal. For something Southern, try grilled chicken and pimiento cheese sandwiches on crusty French bread. For some Mexican heat, put together a panini of chipotle, chicken, avocado and Monterey Jack cheese. Or stack sourdough bread with slices of avocado, tomato, bacon, and lettuce, topped with a nice dollop of mayonnaise. Classic club sandwiches—slices of crispy bacon, tomatoes, lettuce and turkey with mayonnaise on country white bread—always go great with cream of chicken or turkey soup. You can also always fall back on chicken salad on country white or French bread or the simplest of all, cold chicken or turkey sandwiches with lettuce, salt and pepper and mayonnaise on soft white bread. Turn any of these classics into something a bit more sophisticated by changing up the bread to brioche rolls, asiago bread, sourdough, French or Italian. You can, of course, substitute chicken for turkey or the other way around in any of these sandwich ideas. Add pickles and potato chips (if they complement the sandwich), and you have yourself a meal of the best ingredients that just might make you remember that the simple things in life are just about always the best.